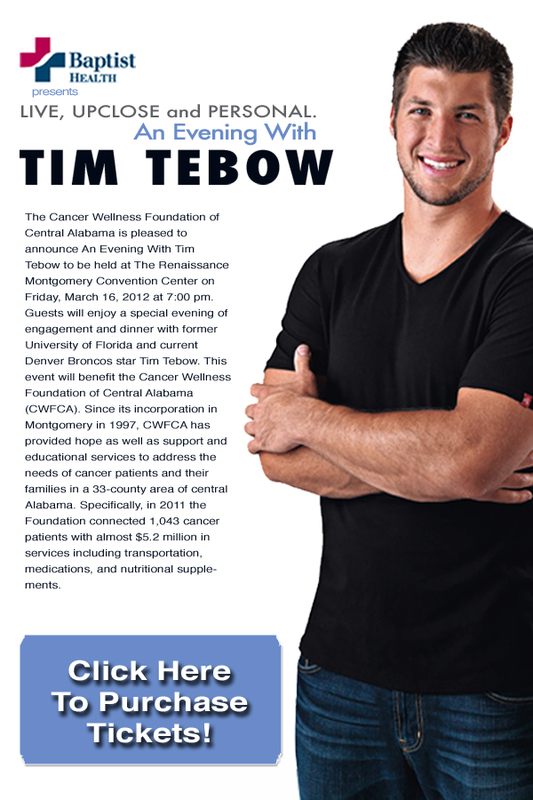 "An Evening with Tim Tebow" was sponsored by Baptist Health and benefited the Cancer Wellness Foundation of Central Alabama. In the offseason, Tim Speaks to Many Universities, Christian Groups and Foundations Around the Country. You knew it was going to be a special day on March 16, 2012. How could it not when John 3:16 is one of Tim’s favorite bible verses? It was the largest event ever held at the convention center in downtown Montgomery. About 2,400 people were in attendance to see football star Tim Tebow, and it was all for a good cause. 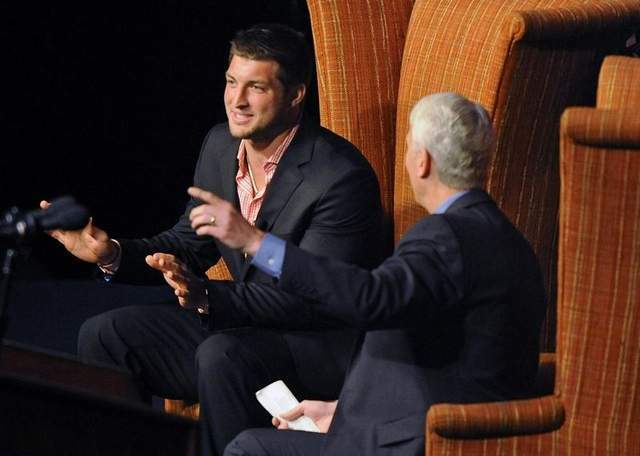 Tim Tebow was the guest speaker for the Cancer Wellness Foundation of Central Alabama and he brought a packed house. The quarterback talked college football, his faith and the foundation. The foundation provides support to cancer patients with or without insurance, in central Alabama. It's something Tebow also believes in. "What they are doing here and the impact they are having on people's lives," Tebow said, it's a great thing. "I think he chose us because of what we do. He is very interested in helping others. When we told him what we did, he said yes and we are very grateful for that," said Drue Tubbs, the President of the Board of Directors. Tubbs says they chose him because of his values as well as his skyrocketing popularity. 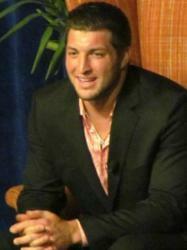 His superstar status was evident among the sold out crowd of Tim Tebow supporters. Tim’s speeches are very uplifting and life changing from a guy who has done so much in so little time says, celebrity booking agent Ryan Totka from AthletePromotions.com, the company who books numerous speaking engagements for Tim throughout the year. Just days before the NFL Draft, during his speech at Union University in Tennessee, he gave five tips of advice: Don’t Wait for Perfect Conditions, Concentrate on What You Have, Don’t Be Swayed By Public Opinion, Cry Out to God and Follow Jesus Even When Times are Good. “His off the field achievements and contributions are what every athlete should emulate”, says Totka. He talked about the decision to commit to Florida, and how it came down to the very last second. While at Florida he became friends with head coach Urban Meyer, and he shared a little bit about that relationship and what it meant to him. In one anecdote, he talked about how the motto for the team his junior year was to finish strong and an interaction between him and Meyer after the game-winning touchdown in the National Championship game against Oklahoma was one of the best moments of his life. "I was coming off to the sidelines, and I undid my helmet and I was taking it off and I saw Coach Meyer. He's usually very passionate, very excited but he looked very sober at this moment. I just remember him walking up to me with his arms open wide and he pulls off his headsets and he just gives me a hug. And he gets emotional and he's squeezing me and he says, 'Timmy, I love you so much. I'm so proud of you. You finished strong.' And I remember how that made me feel as an athlete, as someone who looked up to a father figure. And for me that was one of the best moments – probably the best moment – in my athletic career and one of the best moments of my life," Tebow said. The Heisman-winning quarterback was known for his open Christian faith during his time at Florida and now the world has latched on to the Tebowing phenomenon. The phrase was coined to describe Tebow's frequent dropping to one knee in prayer after big plays. Tebow now has fans, even those from the state of Alabama who probably had reason not to cheer him on during his college days. "I love him. That's all I like," said Sam Lee, one of Tebow's younger fans in attendance. "We actually came here from Nashville, so that ought to tell you how important it was to us," said Ken Harms, also a Tim Tebow fan. "Naturally I'm a big Tim Tebow fan and have followed him all the way to Denver Broncos and cheered him on this whole season," said Sara Matulia, a Florida graduate and Tim Tebow fan. As rumors swirl about his football future with the Denver Broncos, a tight grip was kept on the football star. This meant no interviews or parts of his talk were allowed to be recorded by the media. "I think this is standard practice for professional sports," said CBS 8 Sports Analyst John Longshore. So this night was less about football and more about bringing attention to a good cause. "We've been around since 1997 and we just needed people to know who we are and what we do and that we are available to help," said Tubbs. Organizers say this event brought more people to the Renaissance than other recent events that featured speakers like Sarah Palin and President George Bush. All of the money earned from the event benefitted the CWFCA. In a live auction, his signed jerseys were going for as much as $6,000, all to the great cause. The foundation is a non-profit that was incorporated in 1997. It supports cancer patients in 33 different counties in central Alabama. The foundation spent $5.2 million helping cancer patients in 2011. Since 2010, AthletePromotions has booked Tim Tebow for speaking engagements and corporate appearances around the country.